This High MAP Sensor Voltage - Low Vacuum At Idle is kicking my rear. I've been given possibilities such as a "slipped balancer, aftermarket cam or the potential for slack in the timing chain". Another member advised in a PM that "For the most part a longer duration cam. That will cause a higher manifold pressure at idle. As for your engine, there are any number of things that could be causing the issue. Bad MAP sensor, timing chain off a tooth, cam swap, are just a few." I've done everything mentioned in the service manual for Code 33 and the condition remains. 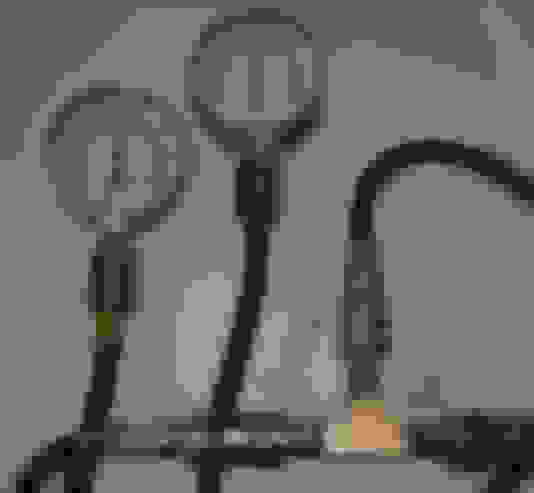 Can anyone post a novice friendly guide to troubleshooting low vac at idle? Have you done a compression test ? You have to create it (vacuum) before you can lose it. No, not to sure on how to use the compression tester kit. I'm trying to understand the instructions. Disconnect battery, Remove all plugs, Disconnect ignition cap to coil wire, Screw fitting into #1 sp hole & crank engine? Repeat on all remaining cylinders? *If that's correct, how am I going to read the gauge while cranking the engine, the hose isn't long enough. How is this testing compression if all the air is coming out of the sp holes? You can disconnect the power at the coil grey connector with pink and white wire. hold the throttle open and crank the engine over. 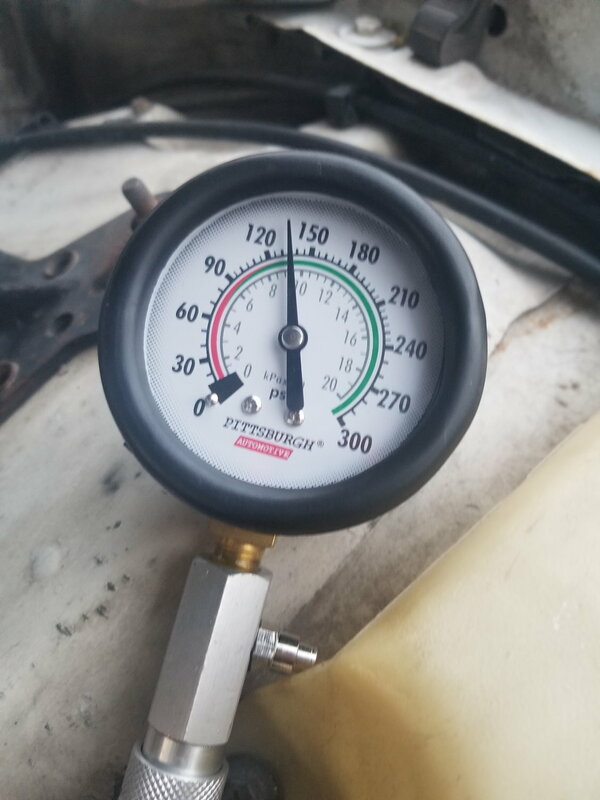 the gauge will keep the psi reading you don’t have to see it while cranking. You are testing each cylinder individually. Removing all the plugs at once just makes it easier to crank the engine over (no compression). So only the cylinder with the gauge will build pressure. A helper is the best bet...someone to crank then engine while you read and record the values. If not, there are remote starter switches...jumper wires go to the starter, with a push-button switch at the end of them that you can press and hold to crank the engine. Or as Tuned suggested...he's a faster typist. Perfect! If you drank, I'd owe you a case of cold ones for all your help. 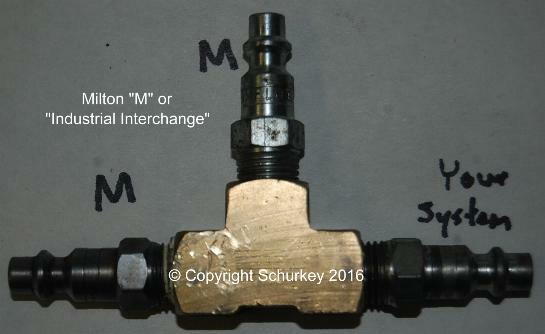 So I have a plan in order, I can remove sp#1 and connect the fitting and follow Tuned's instruction to obtain compression of that cylinder? Why doesn't the test advise completing with all plugs in place? Don't we want the real compression? I mean, maybe i'm overthinking it...or just don't understand. The results would be the same with all the plugs out or one at a time. With all the plugs out there is less resistance on the starter. Trying the compression test after work, but found some interesting bits online though from a person w/ a 89 camaro 305 tbi and with 2.73 gears just like my 92. Complaint: (NEVERLETITDIE) When the timing was set at anything under 6' i couldn't even break the tires loose. at a stop... this is where i started thinking im abit radical on the cam. Last edited by 92RS-HeritageEd; 04-18-2019 at 05:09 PM. 135 psi is a good reading, Cylinders shouldn’t very by much. If compression looks good, I'm at a loss. I was also told in a PM I could try checking for an aftermarket cam by "Measure the lobe lift at one of the pushrods (remove rocker). Multiply by 1.5 for valve lift, compare to stock cam." and "Check to see if the valve guides have been cut down for more lift clearance." but that was like speaking french to a newborn. You got 135 on all cylinders? Oh no, only accessible option was #1. You need to check them all. Cranking compression varies with so many factors it's hard to keep them all straight. Discharged battery--slow cranking speed will reduce indicated compression pressure. High altitude will decrease indicated compression pressure. You need to test 'em all. And if the engine is cranking slower as you progress through the cylinders, you'll have to charge the battery. A faulty gauge...well...that goes without saying. How many people test their compression gauge for accuracy? I use a brass "tee" and the compressed air system in my shop. 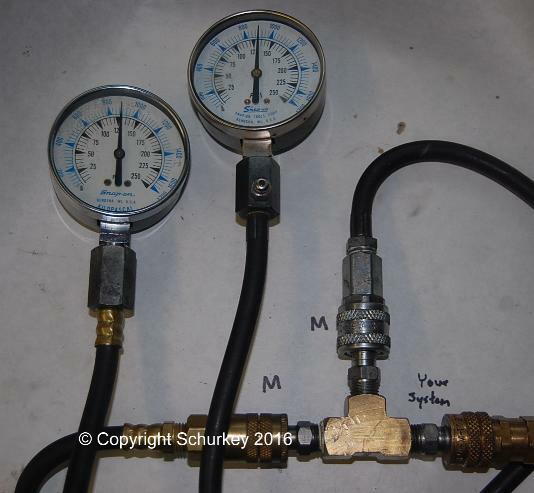 Compare the compression tester gauge to another compression tester, and/or to the gauge on the compressed air tank. IN GENERAL, on these older cars, I usually see "about" 150 psi on good cylinders. Sometimes less, rarely more. As said, 135--150 is pretty common even if I'd really prefer 165--170. A cylinder will RUN at 80 psi. I'm not saying it'll run well. Last edited by Schurkey; 04-19-2019 at 06:10 PM. Rain all day, no garage, unable to complete test on remaining cylinders. Side Note: Speaking of slow crank, what if you get slow crank w/ a confirmed charged battery? Sometimes I get a slow crank on cold start just like the battery's dead but it isn't, then once the car has been started/warmed if turned off the next start the crank seems a tad stronger from time to time. 1. A battery can be charged, but still be defective. Given iffy weather today was light, I replaced a valve cover gasket. plan on finishing that compression test tomorrow. I'll can check connections at the starter then. After a overnight charge on the battery the car did have a noticeably easier crank so i'll have to get it tested. I noticed vac built to like 15-16Hg once at operating temp, and map voltage was the lowest I've seen yet at 1.8v BUT I had that vac ball in the finder disconnected and line plugged. 15-16Hg is Late Ignition Timing but have no clue how this relates to map voltage. At 6*-8* advanced already I don't want to push it further. map map map map map !! !